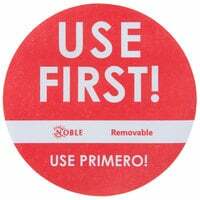 Ensure food safety and freshness with our use first stickers! Minimize the amount of waste in your kitchen by ensuring that the least fresh products get used before their expiration. Whether you run a restaurant, bar, or deli, these use first stickers can save you from confusion about freshness. Allow your staff to move quickly by easily indicating the freshness of premade dishes and prepared ingredients. Sniffing food is not a safe way to determine freshness. Never question which ingredients are to be used first again. A use first sticker can prevent the spread of foodborne illness, and eliminate wastefulness in your kitchen.